Katadyn has been developing water filters, sterilizing agents, and mobile desalinators for travel and marine applications for over 75 years. Numerous international relief organizations and special army units rely on Katadyn products as survival and lifesaving tools. Katadyn's unique products provide safety and convenience for many user groups including militaries, health organizations, and outdoor adventurers worldwide. Katadyn's proven 0.2 micron creamic filter has been combined with an activated carbon filter, creating a system that eliminates not only bacteria and micoorganisms, but also noxious chemicals & most bad taste. A high performance, easy-to- use water treatment plant that can be taken anywhere. Katadyn KFT Expedition Filter - Features the same incredible technology as the Pocket filter, but with a flow rate of up to 1 gallon per minute, for larger groups. 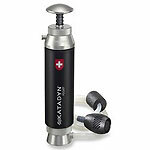 Portable, self-contained, with built-in piston hand pump. Chromium plated brass housing with a stand that's a footrest for easy operation. The 78 inch long ( 2 meters) intake hose is rugged, yet flexible enough to easily drop into a nearby creek or pond. The KFT is handy for travel when packed in its own canvas carrying bag. Used the world over by expeditions, river rafters, armed forces and disaster relief organizations. Order # 22360 Price $1195.00+ s&h. Exclusive silver impregnated ceramic elements ( 3 ) last up to 39,000 gallons. Field-cleanable 0.2 micron ceramic depth filter. Output approx. 1 gallon ( 4 liters) / hour. Weight = 7.3 lbs. Height = 18 inches. Comes with 3 cleanable filter elements, measuring gauge and cleaning pad. Ready to use right out of the box. Works on gravity pressure from upper compartment; no hook-up required. Similar to the Ceradyn, ( above ) includes activated carbon to reduce chemicals and bad taste. Replacement filters available.